If a brighter smile is on your wish list, the La Plata Dental team may be able to help. 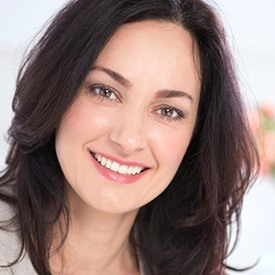 We offer a wide array of cosmetic dentistry solutions including professional teeth whitening. During a cosmetic consultation, we’ll examine your smile to determine the underlying cause of the dental staining or discoloration. This will help us determine what treatments we offer will help you achieve your desired teeth whitening goals. Call our office to schedule your consultation and get started working towards a brighter smile. There are numerous whitening toothpastes, mouthwashes, gels, and strips available in your local pharmacy. However, while these products promise dramatically brighter smiles, they can rarely deliver. There are some patients with mild, surface-level staining, who see results from regular the use of these products. They may also be helpful to touch up the results of professional teeth whitening. 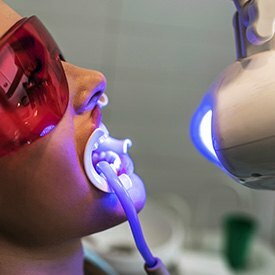 Unlike these over the counter products that are one-size-fits all, professional teeth whitening is customized to meet the needs of each individual patient. 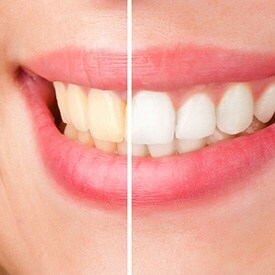 We use professional levels of active teeth whitening agent, usually hydrogen or carbamide peroxide. Our safe application methods keep whitening gel active and in place on the surfaces of teeth for longer periods of time, and they prevent neutralizing saliva from accessing the whitener. This leads to results up to ten shades brighter.